We recently finished our DIY Built-in Bookshelves with Window Seat and I am so pleased with how it all looks! I needed to make a window seat cushion and some pillows for it and for the couches in the playroom. I love using pillow covers because you can easily switch them out with the seasons and they save space! I certainly do not need to fill my closets with more pillows, so pillow covers are the perfect solution! I’ve made no-sew pillow covers before but I figured I’d try my hand at sewing once more (which I haven’t done in 10 years!) 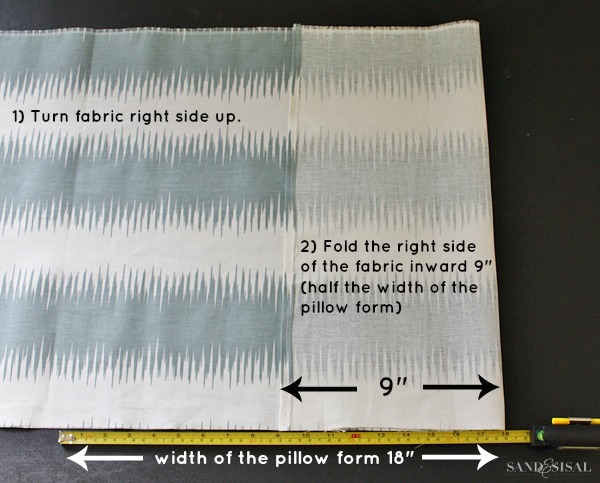 and show you all How to Make A Pillow Cover (or several) for your own home! It is so, so simple and best of all we only use 1 piece of fabric! Online Fabric Store (which I love!) supplied me with some absolutely gorgeous fabric and down pillow forms and guess what? They are giving away $100 OFS gift card to one lucky Sand & Sisal reader! But before we get too excited, let’s take a look at how to some pretty fabrics! I want you to know that when you are shopping online at OFS, the fabric colors online were so true to reality which was awesome! 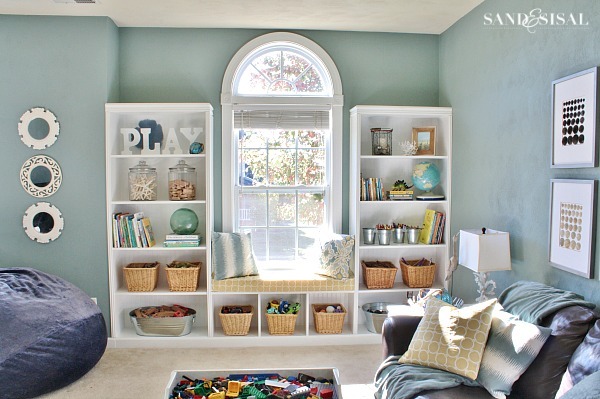 The darker gray-blue color is an exact match to the playroom wall paint, Atmospheric by Benjamin Moore! I was amazed. The first step look at your pillow insert and determine how wide it is. I used 18 inch wide down pillow forms. Next you want to iron your fabric. 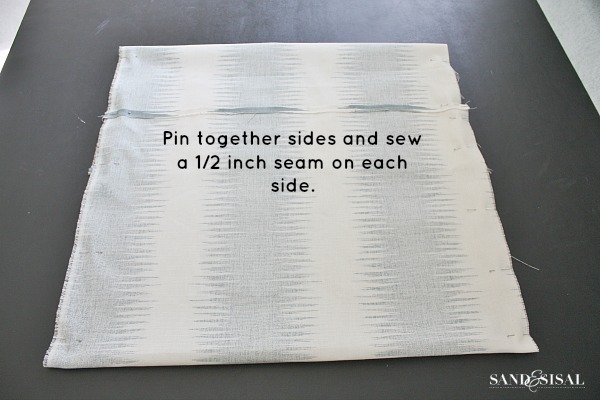 Then cut your fabric so that the length measures 2 times + 6 inches the length of your pillow form. The width should measure the width of your pillow form plus 1 inch. Turn the fabric so the wrong side is facing upwards. 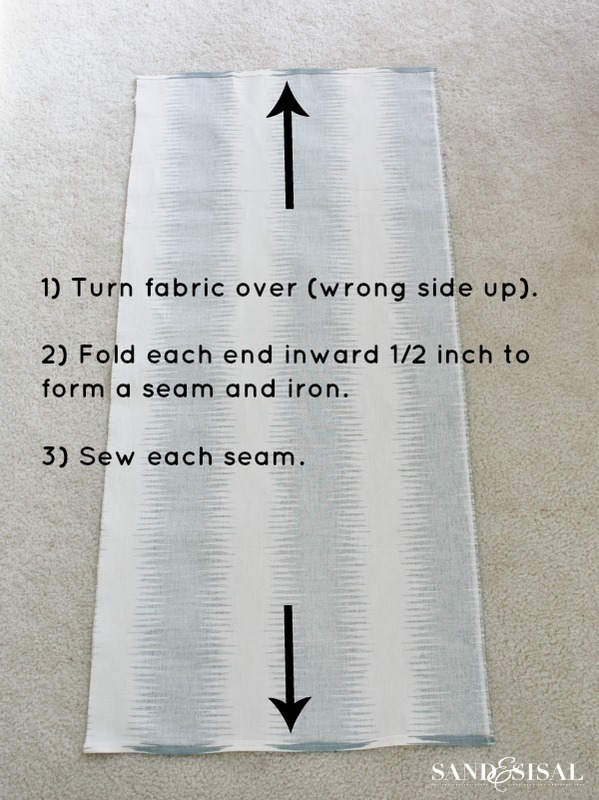 Fold each end inward 1/2″, press with iron and sew. After sewing the hems, flip fabric over so that the right side is facing up. Then fold the right side of the fabric inward 9 inches, which is half the width of the pillow form. 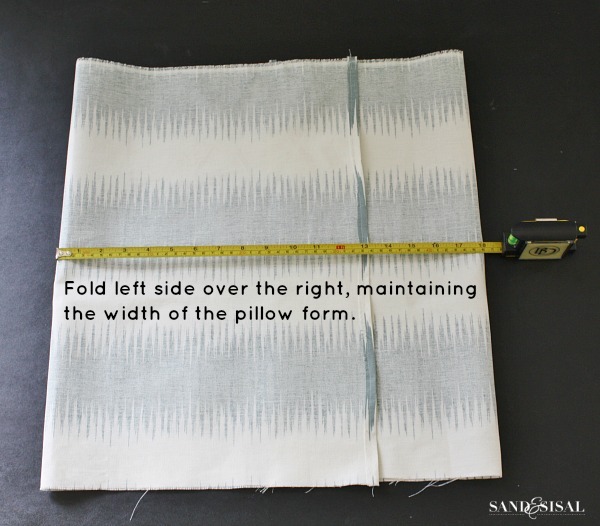 Next fold the left side over top of the right side, maintaining a total width of 18″ (the width of the pillow form). 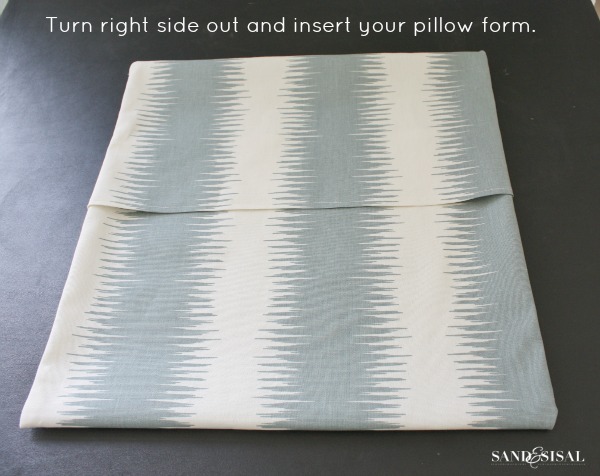 Turn the pillow cover right side out and insert your pillow form inside the pillow cover envelope. That’s it! Super easy! I love this print because you can get two different looks from the same fabric! It is Premier Prints: Harford Saffron Macon. 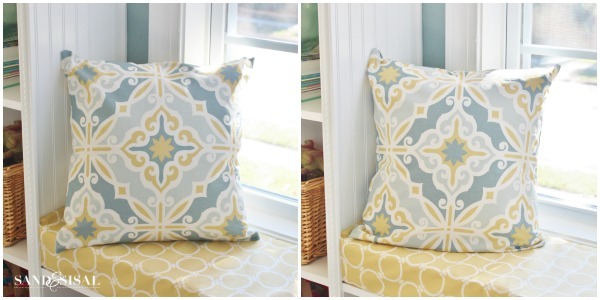 I’ll share with you all soon how to make that window seat cushion too! So stay tuned! These make great gifts and use very little fabric. I hope to make some pretty holiday pillow covers this next week! I hope you give it a try. Are you ready for the awesome giveaway from Online Fabric Store? A $100 gift card can buy you a nice amount of fabric, pillow forms, cushions or you can even use it to buy some pre-made decorative pillow from OFS! Best of luck & Happy Sewing! « Inspire Me Cyber Monday! Love your built-ins, and the pillows add so much. Thanks for the DIY. 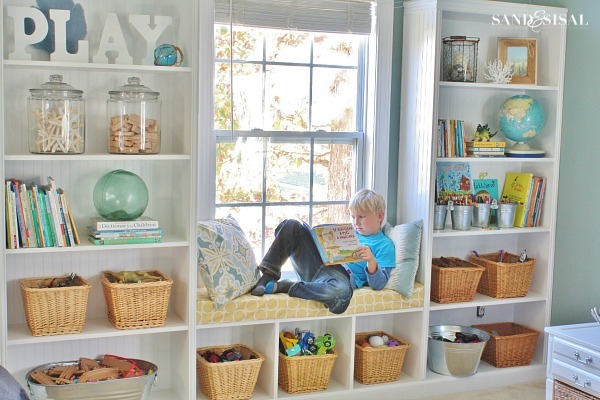 I love the bookcase and window seat. But the pillows so beautifully bring in pops of color into the room. 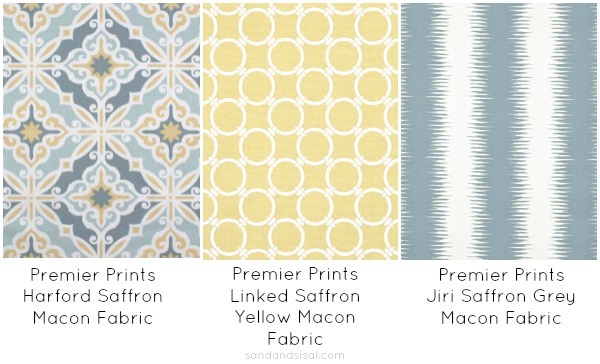 The Premier Prints: Hartford Saffron Macon fabric is so pretty. I want to use it in my home! 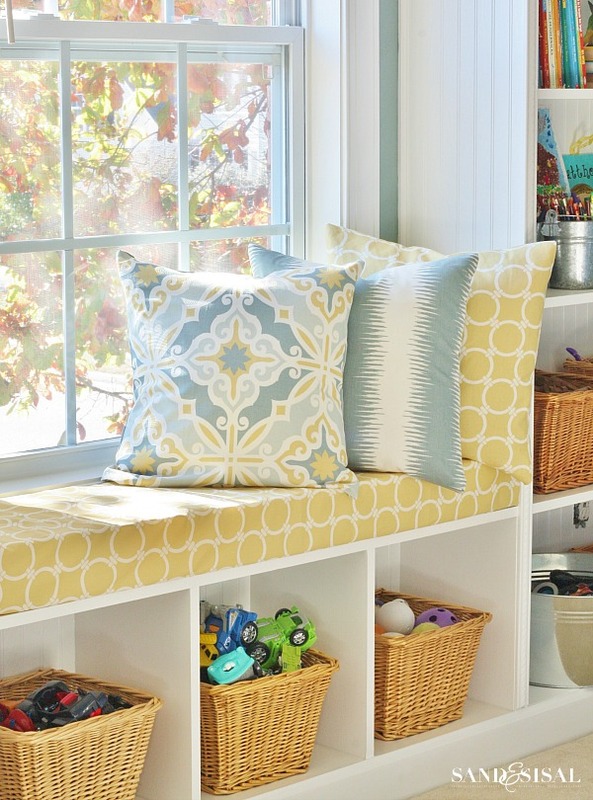 I need to make a window seat cushion, so I am tuned in for when you share your “how to” with us! Thanks for great tips on how to sew pillow case, and thanks for the giveaway! It is SO worth it to make the flap on the backs, so you can remove, to clean or swap out. Your room is beautiful and the built in bookcases and window seat add so much. I love the fabrics you chose for the pillow covers and seat cushion. You are a very talented young woman. The next pillow covers I make, I will use your easy directions rather than going the zipper route. Love your home! I would make some pillows – my old ones need replacing and your tutorial is so easy – thanks for sharing. My dining room needs drapes. So it will be a great project to tackle. They were way easier to build than we ever thought possible. I’m kinda kicking myself for not attempting them earlier! The next big DIY project will be built-ins in the familyroom! We just moved into a new home and I need tons of pillows. Thanks for the tutorial – I will use it for sure. You’ve got to check out OFS’s prices on down pillow forms. They are insanely affordable! I think even I could follow that pattern! Bonus, so much easier to wash a cover than the whole pillow. Between kids & dogs, I’ll have to find an easy care fabric :). We currently don’t use accent pillows for that very reason. EXACTLY! I have 4 kiddos (2 boys) and this is our playroom…. ie: disaster room. Everything in it MUST be washable. I love, love, love the concept of pre-washed, easy pillow covers! Nice giveaway. Thanks for hosting and for the chance to win. I’ve also shared your giveaway on my Giveaway List for just sewers & quilters at wowilikethat.com. Thanks again. 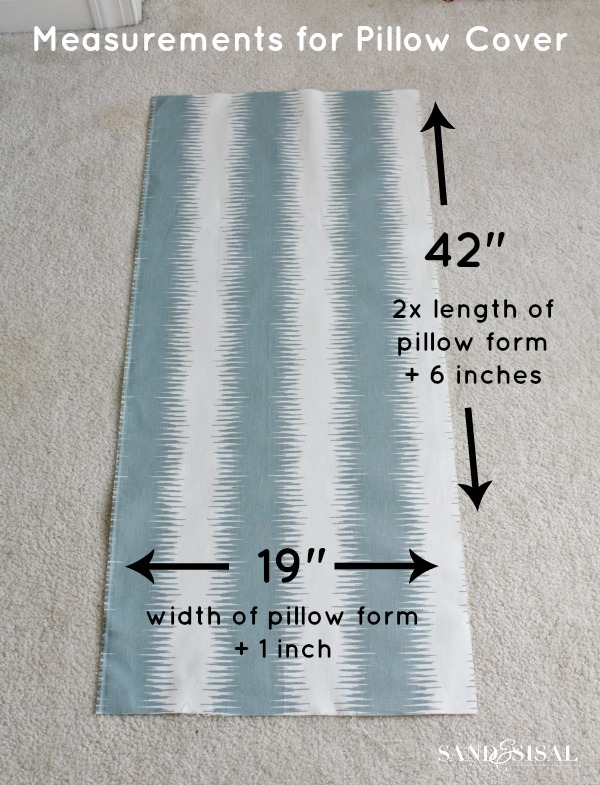 I love how easy it looks to make these pillow covers…I would ABSOLUTELY make them for my family room sofa. This was a terrific post since I am not real comfortable with zippers. Thanks! I would make pillow covers for my couch pillows. My pillows are a little too girly for my family of boys. I think I would make a beautiful doona cover for a seaside location. Thank you for this tutorial. I am a beginner and this is really helpful! I didn’t think it could be this easy to make something so nice! I hope you will show us how to make the seat cushion cover too! I love windowseats and yours is just awesome. I would use it to get supplies for new curtains. Why can’t I ever get the Give Aways to work. They just keep turning and turning and I can’t see any entry form. Hi Dorothy. I’m sorry you are having troubles. Are you viewing from a phone or a desktop? Also, are you reading the blog post from an e-mail subscription? If yes, then you need to click on any of the links (like the title or the “read more” at the bottom of the email to view the blog post directly on the website. The rafflecopter entry forms never show up on subscription feeds. Your room is beautiful! Thanks for sharing. If I won the certificate I would get some get some fabric and interfacing to make weekender bags. Thanks for the chance to win! I would recover an ottoman I have and use it for my new nursery! I would buy velvet fabric to make a diamond tufted headboard! I am really into creating table runners for each holiday right now, so that’s where my winning fabric would be used. I have so many ideas to make them! I would make a beanbag for my son’s room. I love your pillows! I need to make roman shades or drapes for both living and dining rooms! Definitely pinning for later! We just moved so I need to make lots of things including curtains and pillows. I would actually make the pillow covers, my pillows are getting so worn looking. I need to make some valances so that’s first up on my list. Your pillows turned out great! Wow I too haven’t sewn since high school home economics in the 80’s but I think your tutorial makes me want t try my hand again. I would make personalized bags and pillows as gifts for my friends and family. I love your tutorial on how to sew pillows. I have a question for you: do you wash the fabric first before you sew them? You can, but I to be honest, this time I didn’t. I rarely wash the pillow covers in the washing machine. Usually I just spot clean with a damp cloth if needed. I need some new seat pillow cushions so that is what i would make first. thank you for the chance! I would like to make some outdoor pillows! Wow, so many beautiful fabric choices! It would be hard to decide which ones to choose! You’ve done a fantastic job on your play room! Love it! Awesome give-away! And awesome job on your site…I love following you! I would make pillows or window seat cushion. I would make stockings!…. Thank you so much for the giveaway! I like the fabrics you chose! Great giveaway! PS. I’d probably make pillow covers too! I would definitely make curtains with the fabric if I won! I made pillows about a week ago!! Love this room, btw. From the paint color to the shelves, I love it! I think I may do something like this in my office, it has the same set up. Thank you! Such an easy pattern! Zippers scare me so I haven’t tackled pillow covers. This changes that! I’m excited too try them out! And I love your site, by the way! The hubs and I have done some projects together that you posted and I love them! Also, I’m waiting for some OFS fabric in the mail right now to make curtains. Next up I’m going to try my hands at reupholstering! I was so happy when I found them! I would definitely make these pillow covers and try to make curtains for my bedroom. Great step by step instructions. I was just writing a blog post today and ended with I have this gorgeous fabric left and must try to make pillows! This looks so easy. I can’t wait to try it. Now if I could only win that giveaway for pillow forms and some complementary fabric. Fingers crossed! Definitely pillows or pillow covers! I’d make some pillow covers! What an easy tutorial! I would love to do this in my daughter’s room! If I won, I would definitely make a couple different things. I would start with making a seat cover for this bench seat I’m currently on. I’d love to make some cute decorative throw pillows/covers too! I would make some chair covers. Well done Chica! I love sewing. If I won that gift card I could finally re-cover our ginormous bean bags! Looks great, very pretty room. I’d make pillows for our great room. I recovered all of our outdoor cushions this past summer. Time to start on the inside! I would make throw pillows. I have been on the hunt for fabric to make Euro Square pillow covers for my bedroom. I would love to select some with the prize certificate. Thanks for the tutorial! I love the pillowcases, and the colors. If I won, I’d buy endless yards of fabric and quilting batting! The built ins turned out great. I love the window seat and the choices of fabrics used. HI,this room is spectacular>love the pillows! I’d probably select more pillow fabrics! Such lovely fabric, and what a great giveaway. I’ve been wanting to change my existing pillows and this looks simple enough for this beginner! Pillows can be expensive! Beautiful! The bookshelves/seating area is an incredible way of making the most of your space. Thank you so much for the chance to win the giftcard! Thank you Rhiannon! We are really loving the builtins! I would make new throw pillows and a valance. What a great built-in! Beautiful pillow! 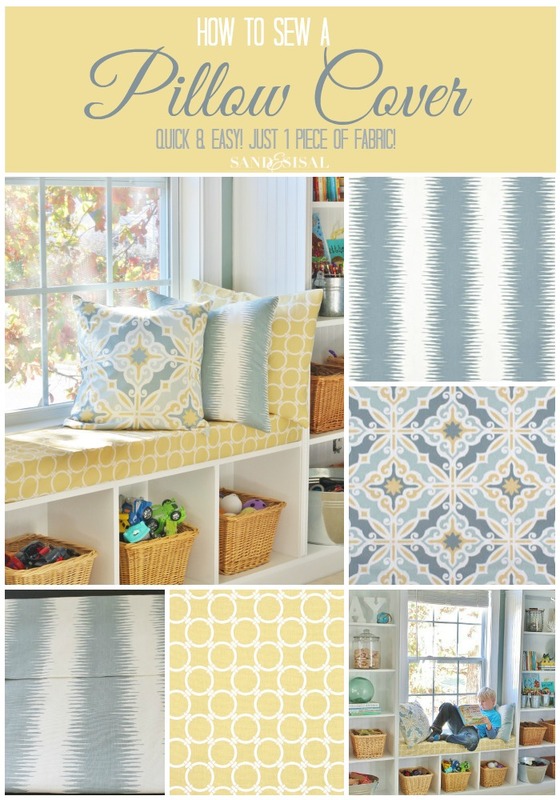 If I were to win, I would either, a) use the credit towards fabric for curtains, or b) fabric for some coastal pillows! I’d like to make some pillows and/or curtains.